March Against Monsanto on May 25th! SEATTLE, Wash. (May 1, 2013) – March Against Monsanto has announced that on May 25, tens of thousands of activists around the world will “March Against Monsanto.” Currently, marches are being planned on six continents, in 36 countries, totaling events in over 250 cities, and in the US, events are slated to occur simultaneously at 11 a.m. Pacific in 47 states. Partners facilitating the organizing of March Against Monsanto include The Anti-Media, Activists’ Free Press and A Revolt – Digital Anarchy. Major sponsors include GMO Free USA, NationofChange and Films for Action. 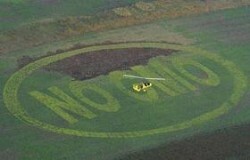 Official website: www.march-against-monsanto.com.